We had the annual Bug Run today up at Burger University, so Debbie and I headed up there, arriving just before 10am to help setup. Well, it seems several other people had the same idea, but earlier and everything was already setup when we got there. Thank you Louis and Candy for heading it up. The event was supposed to start at 11am, but several clubs showed up before and hung around since Burger University didn’t open for lunch until 11am. We had a lot of people come by to say hello and make a donation, but few it seemed actually wanted to go on the ride. We of course didn’t mind, and it was great to have a lot of people hanging around socializing. In the end, we did have about 10 riders go out to find bugs, and we did give away the trophies to well deserving riders. As you will see from the photos, the first place winner not only got a bug in the center of their headlight bulls-eye, but they actually got a flying insect leg that attached itself to the center of their bulls-eye and flapped around all the way back to us where we could clearly see what it was and where it was attached. Amazing. And finally, the best shots of the day (not) were taken by Debbie of Louis and I napping near the end of the day. Max Ride is Saturday at Cowboy HD. The New Life Riders Bug Run is also Saturday up at Burger University. At the ROT Rally outside the gate, Christian Unity will be be having free bike washes. At the UCOA Family Campout in June (23rd-25th), Christian Unity will be providing Sunday morning breakfast and Sunday service, including a full worship band, immediately following the breakfast. We had out April meeting thieving at IHOP. We had fairly light attendance this evening, but Don and Susan brought the trophies for the Bug Run coming up in a little more than a week, and we also talked about the Egg-Sraveganza coming this weekend. It lookalike riding season is here, and apparently every weekend is filling up with activities. We had our annual Bug Run today up at Burger University in Georgetown. We had a very good turnout. I counted 14 of the clubs that are part of UCOA, and of course some from TMRA, a couple of CMA chapters, and several independents riders as well. Oh, and the burgers from Burger University were great too. They opened up at noon, so by then we had quite a crowd outside waiting for lunch. I think we almost filled them up. The second volume of my Moments book “Moments 2” has been published, so I was privileged to distribute a bunch of copies to most everyone that attended. If you didn’t happen to make it to the Bug Run today, then don’t worry, I have many more copies and I will be bringing them to UCOA in a couple of weeks. The BUG Run is Sunday!! 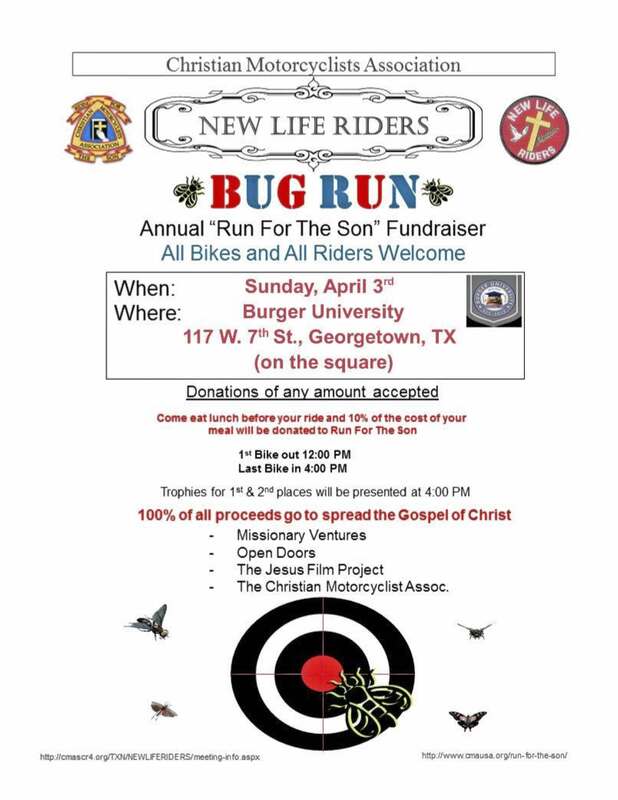 Our New Life Riders Bug Run is this Sunday at Burger University in Georgetown. First bike out is noon. Come on out for some great burgers, a great ride and a chance to win a great trophy. 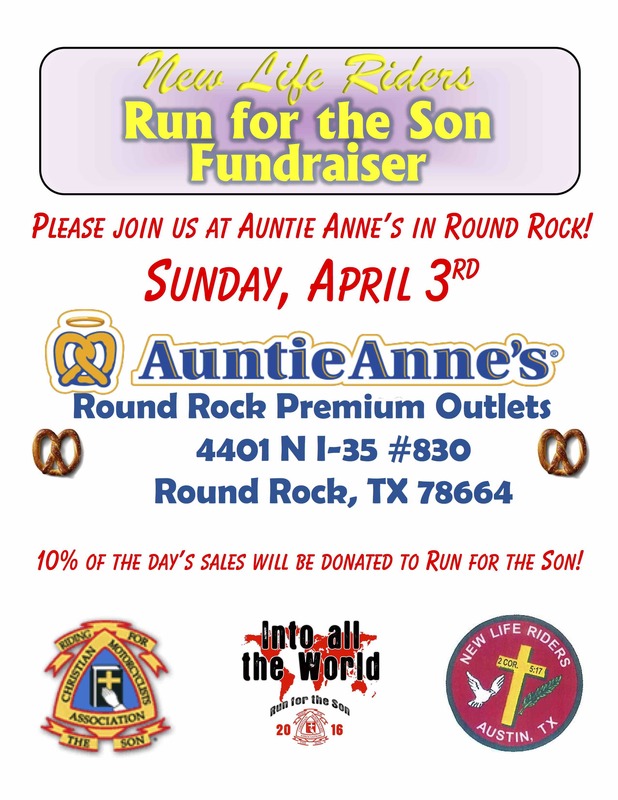 And if you want even more fun after the Bug Run, head on over to Auntie Anne’s in Round Rock for a pretzel!